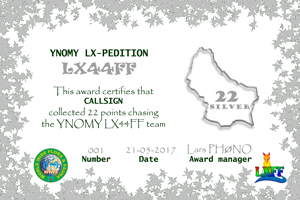 As blogged before YNOMY DX Group will be active as LX44FF from various WWFF nature reserves on 20 & 21 May 2017. Note that the same call will be used by other activators after this date. Top 3 chasers from each continent will receive a special award. Chasers can collect points by contacting LX44FF on May 20 & 21. Each first contact with a reserve will count as 4 points. Each new band or new mode contact with the same reserve will count as 2 points. SWLs can request an award by email, providing at least two consecutive contacts per park/band/mode. 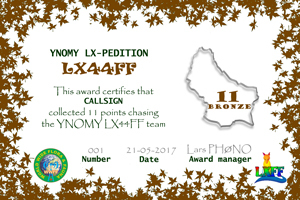 LX44FF will be active from at least six different nature reserves during the LX-pedition. At each reserve we will use CW and SSB on several bands. This gives chasers a lot of different band/mode slots over the weekend to contact us.